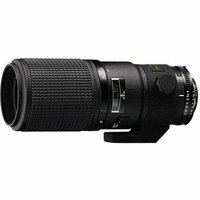 The Nikon 200mm f4 AF Micro Nikkor Lens is a versatile telephoto micro lens for macro photography. The Close-Range Correction (CRC) system provides high performance at both near and far focusing distance and ED glass elements offer high-resolution and high-contrast image even at maximum aperture. Accepts 62mm filters.